True, if ‘long lived’ means 300 years. Not true if ‘long lived’ means (tens of) 1000s of years. The argument that thorium is ‘not green’ because it is supposedly creating the same kind of long lived waste as our present day light water reactors do, may have been scaring off some new thorium enthusiasts. The argument however is false. Using it demonstrates either the inability or unwillingness to understand how different molten salt reactors are from everything we’ve known so far about nuclear reactors. The radiotoxicity produced by a molten salt reactor is much less than that of a light water reactor, and lives only a fraction of the time. But maybe we shouldn’t be too harsh in our judgements on those who use this argument. All of the confusion – unconsciously or consciously continued – goes back to one single article from an anonymous writer of this report on the thorium cycle by the British National Nuclear Laboratory (NNL). This report boldly states that “It is estimated that it is likely to take 10 to 15 years of concerted R&D effort and investment before the Thorium fuel cycle could be established in current reactors and much longer for any future reactor systems”. This may be true when referring to the thorium fuel cycle in solid fuel reactors but the statement does not apply to the fuel cycle in molten salt reactors. According to this blog the writer of the author of the NNL report on thorium ‘readily admitted that he did not consider use of thorium in liquid fuel forms or in molten salt reactors‘. By doing so, this expert certainly succeeded in creating a lot of confusion. Some countries and companies are working on plans for using thorium in solid fuel reactors. But although some of the advantages of thorium can be used in this way, thorium in the solid fuel cycle still suffers from the design difficulties of present day reactors. A properly designed molten salt reactor ultimaltely consumes all actinides it and turns them into useful energy. *) It produces only a fraction of the waste of light water reactors, and this fraction needs storage for about 300 years. Molten salt reactors are radically different than today’s solid fuel reactors and virtually all of their advantages are based on the fact that the fuel is a liquid. Non-thorium fuels like uranium, plutonium and the waste of present day reactors can all be used as a fuel in molten salt reactors. Many experts consider the thorium to be the ‘cherry on the pie’ of molten salt reactors. In an MSR, thorium transmutes into uranium 233. U233 has far less chance of transmuting into higher actinides. The amount of actinides produced in a thorium molten salt reactor is 1000 to 10.000 times lower than in a light water reactor. Actinides are the elements that are the ‘long lived’ problem today’s nuclear waste. *) This is the case for molten salt reactors that employ fuel processing, either online or periodically. It is possible to use molten salt reactors without fuel processing or with simple forms of processing like gas removal. The degree of fuel utilization depends basically on the choices made by the country that employs the reactor, see for instance the interview with David LeBlanc on this site. How can we be sure the waste is safe after 300 years? If you want an answer that satisfies you, it’s best to understand how it works. The nuclear fission reaction is basically the same for all types of reactors. It is what happens when a heavy metal nucleus is hit by a neutron. Following this collision, two things can happen: it can fission or simply become one neutron heavier. The elements and isotopes in a nuclear reactor can be compared to characters in a family drama. The family consists of uncles (U) and daughters (Fp). If an uncle catches a neutron, hopefully he splits in two, releasing neutrons and a flash of energy. In the act he magically transforms into two daughters (Fp), a heavier one and a lighter one. The uncle may also just become one neutron heavier. That means he changes character. He can become a new isotope or a whole new element – right away or later. Every time the uncle catches a neutron again, there is a chance he will fission – releasing his energy and neutrons. The daughters are radioactive. Some of them quickly change into something else, releasing radiation and more heat in the process. The waste of well designed molten salt reactors consists only of ‘daughters’ and not of ‘uncles’. After 300 years, the remaining material is less radiotoxic than fresh uranium ore. 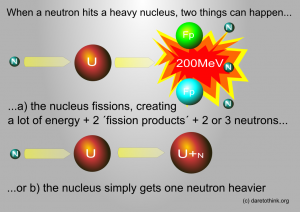 The first possibility is that a fission takes place (a): the heavy metal nucleus splits in two, creating a staggering amount of energy, two or three neutrons and a bonus: two new lighter elements that appear out of the fission reaction. Usually two different elements appear. These are called ‘fission products’. There are about three dozen of elements that can be formed in this fission reaction. This means that over time, in a nuclear reactor, a mixture of about thirty elements (and hundreds of isotopes, the elements come with different numbers of neutrons) are formed. These come in different proportions and the noble gas xenon is the largest fraction. Many fission products are radioactive, meaning they are unstable and will decay into other elements, producing more heat as they do. Others are stable from the outset. For any radioactive element, there is a simple rule: the more radioactive it is, the shorter it lives. Outside of the reactor, the fission product mixture is quite radioactive for a while. But it soon loses most of its radioactivity, and after 300 years, it will be less radioactive than the ore you have taken from the ground in the first place. 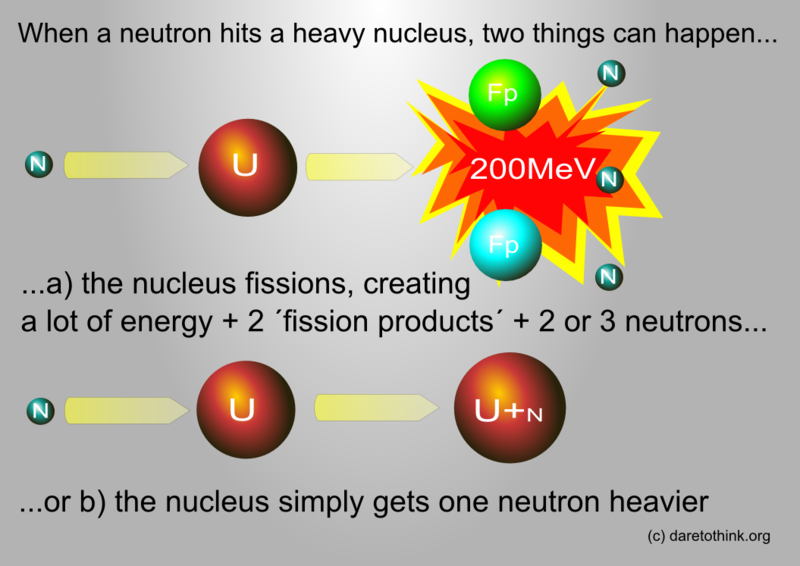 The second possible thing that can happen if a heavy metal nucleus catches a neutron is that it will ‘eat’ the neutron: it simply becomes one neutron heavier (b). This ‘catching’ process can go on for a while: with every neutron caught, the nucleus gets heavier. With every step it may change into a new isotope, which sometimes decays into a different element. These new heavier elements are considered as the nasty part of the waste. They are usually called ‘transuranics’ because they are further in the periodic table than uranium. One of them is plutonium, which can remain hazardous for thousands of years. Plutonium is the main reason that nuclear waste from our present day reactors needs to be safely stored for thousands of years: some plutonium isotopes are suitable for making weapons. The better way to think of ‘nuclear waste’ however is to consider it as ‘unburnt fuel’. In our present day reactors, around 96 per cent of the material is simply unused fuel (94% of uranium, the remaing 2% is plutonium and smaller fractions of more exotic transuranics), that cannot be used because the solid fuel becomes contaminated with fission products. The whole idea of using solid fuel and pulling it out of the reactor after 5 years is bit like throwing water over the wood in your fireplace at the moment the fire is really going: you’ll be left with a smelly pile of wet and half burned wood. The trick with the more advanced types of molten salt reactors is that you can keep all transuranics within the reactor until they fission. That’s because in these reactors, the fuel can be kept in optimal condition at all time: fission products that interfere with the reaction process are continuously removed by online fuel processing. This is especially important for xenon, which is one of the fission products. Xenon is always a problem in reactors, because it eats neutrons, to a degree that it completely blocks the reaction. In a solid fuel reactor, fission product removal is not possible. Over time, they build up and make the fuel useless. In a molten salt reactor, xenon removal is easy. Here, it behaves like the bubbles in your cola: it comes out on its own. The operator only needs to catch and store it. In a molten salt reactor, 99% of the waste is fission products. About 1% of the transuranics are left behind by the separation process: no chemical process is 100% efficient. The fact that fission products are regarded as ‘waste’ is because they originate as a mixture. If these fission products can be purified, many of them are extremely valuable: some of them are very promising candidates for new forms of cancer treatment. This excellent documentary by Gordon McDowell explains why nuclear waste is only waste as long as it remains a mixture of different elements. Molten salt reactors allow the separation of fission products, turning them into valuable materials for instance for medical purposes. Some of them are potential life savers that can play a key role in new cancer treatments.